A scene from Branar's The Shape Of Things. 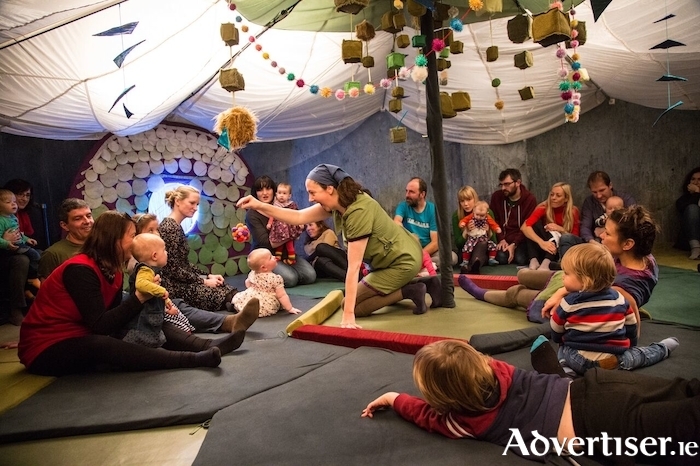 PUPPETRY, MUSIC, shapes, sounds, tactile objects, and interaction, all aimed at Galway's tiniest theatre goers, will take place in March as Branar Téatar do Pháistí and The Mick Lally Theatre host two children's shows this month. Puppetry, object theatre, music, and sound combine in The Shape of Things, an interactive show by Branar and Starcatchers, set in a specially designed soft and tactile space for adults and babies to relax in together. It is suitable for those aged from six months to two years. It is on this Saturday at 11am, 1pm, and 3pm. Na Sióga agus an Gréasaí is aimed at those aged four and upwards, and takes place on Saturday March 10 at 12 noon and 2pm. With an emphasis on live music and magical puppetry, this spirited and humorous production tells the story - in English, as Gaeilge, and in Polish - from the elves perspective.